The Big Bang and cosmic evolution have many things going for them — on paper. Start with some assumptions, do some calculations, make impressive pronouncements, let the sycophantic science media get the bit in their teeth and gallop to the public. But do not, under any circumstances, let actual science interfere with grandstanding. Evidence is bad medicine for speculations in secular cosmogony and cosmology. Since observed evidence causes problems for secular cosmogony concepts, secular scientists come up with rescuing devices. 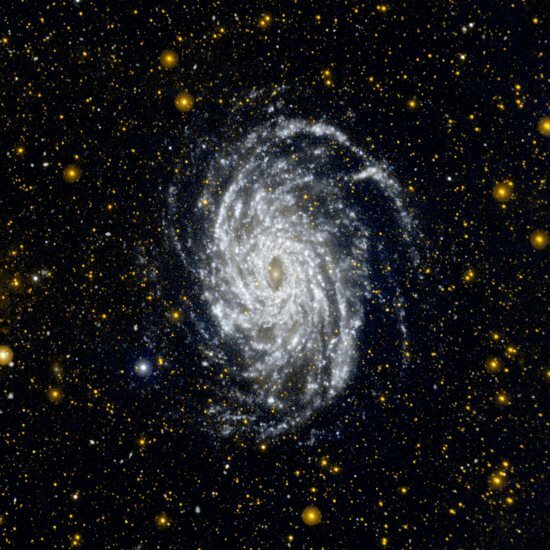 Dark matter, dark energy, dark other things that have never been observed but look good for calculations abound, and "explain" why spiral galaxies hold their shape after assumed zillions of years. These things have not been observed, only inferred according to presuppositions (see "Dark Matter Remains Missing"). Another rescuing device is to come up with new physics, and even find a new theory of gravity that makes things all better for the Big Bang. I reckon that this is the fallacy of moving the goalposts on a grand scale. By doing these things, they're tacitly admitting that the Big Bang is wrong. Cowboy up, people! The evidence y'all deny testifies that the universe was created much more recently than you want to believe. To finish reading, click on "Why look for a new theory of gravity if the big bang cosmology is correct?" Also worth seeing is "The Expanding Big Bang Fairy Tale".